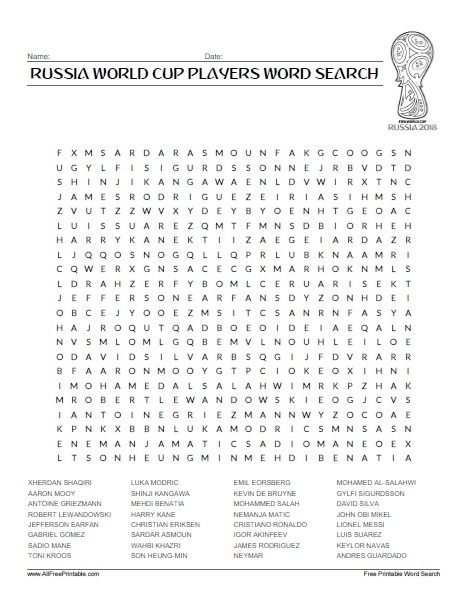 Free Printable Russia World Cup Players Word Search. Free Word Search of FIFA WORLD CUP RUSSIA 2018. Print this word search to find all your favorite players going to this international football tournament to take place in Russia from 14 June to 15 July 2018. Share with football fans, friends and family to have fun before watching the matches. Find players like Cristiano Ronaldo, Lionel Messi, Tony Kross, Kevin De Bruyne, Harry Kane, Keylor Navas, Andres Guardado, Sadio Mane, Mohammed Salah, Luka Modric, Luis Suarez, Neymar, and many more. This word search includes 32 player (1 from each team) and the solution on page 2. The FIFA WORLD CUP RUSSIA 2018 Players Word Search Game is ready to print in PDF format.